Bassist with Austin Symphony Orchestra, San Antonio Symphony, Austin Lyric Opera Orchestra and Tosca Tango Orchestra: double bassist, cellist, recording artist, producer and educator. The Austin-native musician exemplifies the ubiquitous artistry of a true music lover, heeding to no one genre, discipline, or stage. Ms. Valls studied at The Oberlin Conservatory and went on for a Masters of Music in Double Bass Performance at the Manhattan School of Music and a Doctorate of Musical Arts at the University of Texas at Austin. She has shared the stage with a dozen orchestras including the Austin Symphony Orchestra, San Antonio Symphony, Austin Lyric Opera Orchestra, Tosca Tango Orchestra, and Orquestra da Radio e Televisao Cultura in Sao Paulo, Brazil, where Ms. Valls was principal bassist. She appears regularly with chamber ensembles, tango and bluegrass bands, in studio recording sessions, on film soundtracks, television and radio jingles, and popular festival stages around the world. She is presently a faculty member at The Austin Chamber Music Center, The Girl’s School of Austin, and Huston-Tillotson University. 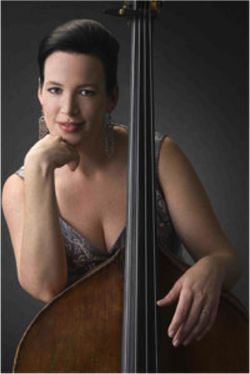 An invited performer at the 2007 and 2009 International Society of Bassists Convention, she is a regular guest artist and clinician at the North Texas Bass Camps and the Oklahoma Summer Arts Institute, among others.